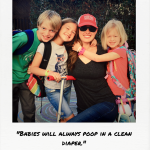 There are LOTS of ways we support our fellow moms. We buy from their at-home businesses, we carpool to soccer when she has to be in three places at the same time, we text pictures of the school field trip because her schedule didn’t allow her to come. But when I asked a group of friends to take off their makeup and wear face masks and let me take pictures … y’all I was sloppy with appreciation at the response. I’m sure the spa-quality facials were a pretty good incentive but still, this was some grade-A mamas helping mamas right here. Best of all, I was able to treat my friends to some food, drinks, and a little pampering courtesy of Seoul Mamas. 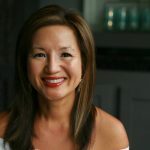 Based in St. Louis, the Seoul Mamas owner, Geri Cope, is a mom with a passion for her kids and skin care. 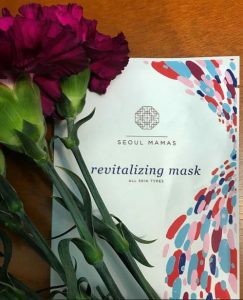 While traveling to Korea for the adoption of her son, Geri met a young woman who introduced her to the K-beauty sheet masks that became the starting point for Seoul Mamas. Within a day, they had a partnership and a plan and Geri had a new business to run alongside her household of four children and one tiny Yorkie. 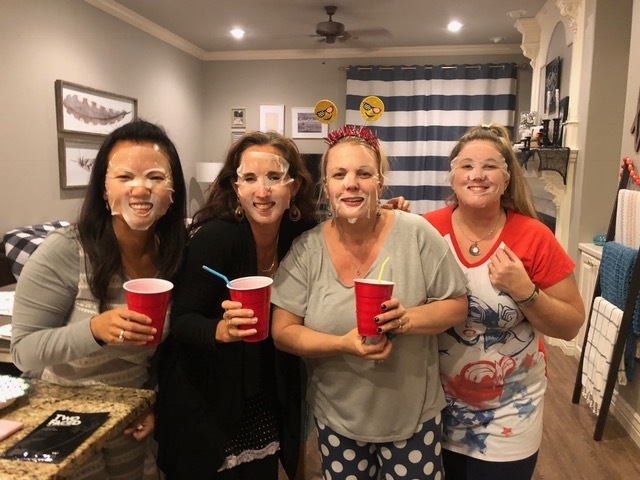 Focused on providing great skin care for busy moms, Geri made sure the face masks would stay in place while also taking care of the house and kids. Most face mask directions will instruct you to lie down and relax to enjoy the experience, blah, blah, blah…if I had time to lie down I probably wouldn’t need the rejuvenating masks. Geri advises putting on a mask, going about your kids’ bedtime routine, then tossing the mask out, rubbing in the remaining serum and then bingeing Ozark on Netflix. (Okay, I added that last part, but you know that’s what you’re doing.) 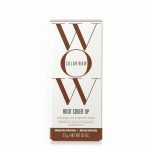 Then you will wake up the next morning with smooth, refreshed skin. One of my guinea pigs, I mean friends, texted me the next day to tell me that her makeup went on so smoothly the next day and her skin felt “silky soft and supple”. The masks are intentionally designed with extra serum that you can use on your neck, arms, decolletage, anywhere you like really. The extra serum did make the masks a little difficult to unfold and apply without dripping, especially since we were all huddled around my kitchen island. Next time, I will pull the mask out while squeezing the top of the package to squeegee some of the serum off. Those with foresight rolled over the top of the package and took the remaining serum home to use later. Those of us who are spazzes (points to self), stupidly chucked the extra in the trash. In a more private setting, I would have put on a tank and really indulged. We had two different masks to choose from: the Two-Faced Bright’n’Tight Masque and the Revitalizing Mask for all skin types. I chose Two-Faced because of the vitamin C and the focus on minimizing sun damage as well as improving skin texture and tone. The sheet was a little more sheer that the other mask once applied but felt refreshing and stayed put, even as I attacked a plate of breakfast foods and sipped on mimosas. Most of my party leapt for the Revitalizing Mask and its tagline to help “reduce the appearance of fine lines and wrinkles.” This is the slightly more opaque sheet mask and judging by how much food was left, did not hinder anyone from snacking and enjoying the evening. 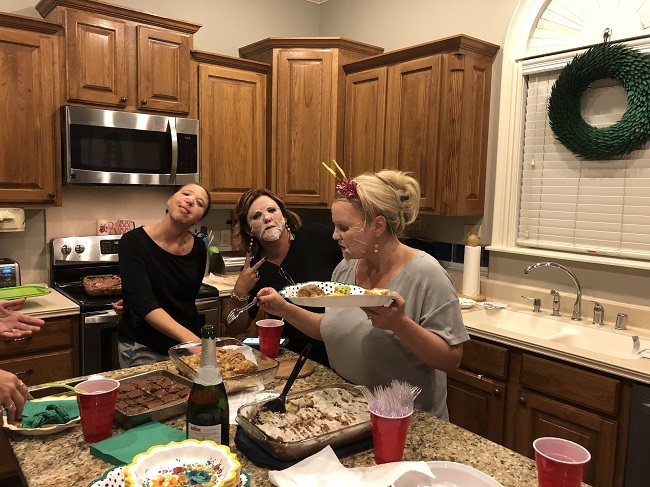 Several women left their masks on while we played bunco with no problems. Once removed, you’ve never seen so much bright, glowing skin! Everyone kept looking in the mirror or touching their faces because our skin felt so soft and tight. 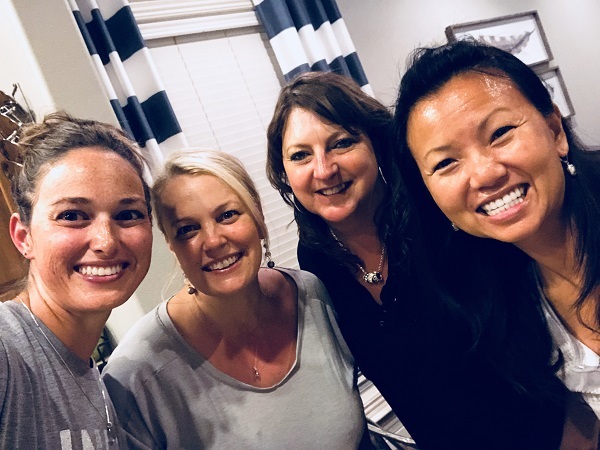 Good food, good friends, and glowing skin made for a pretty fabulous night! If you happen to visit a W Hotel, you may recognize the Two-Faced mask carried by the luxury destination chain. If you shop at Neiman Marcus, you’ll find Brighten & Tighten. Locally, Geri has developed a mask specifically for Premier Dermatology here in NWA. 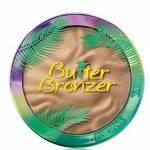 I have talked many times about the wonder that is K-beauty and the innovative beauty products coming from the country. 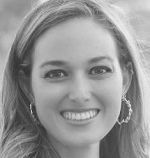 The partnership between an America-based mom and a Korea-based young woman has launched this family-focused company and I can’t wait to see what else they offer in the future. 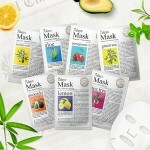 Beauty Buzz is sponsored by Seoul Mamas beauty masks. 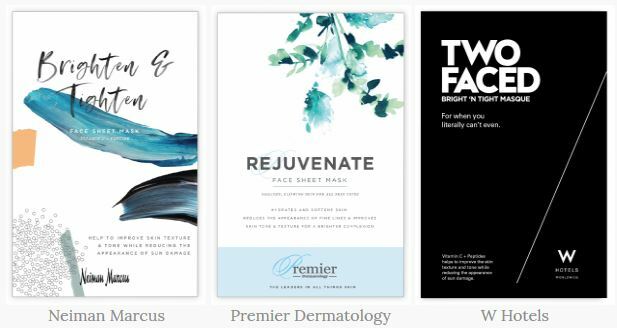 Click here to read more about Geri and how these sheet masks can improve your skin and help you get in a few minutes of needed self care. Giveaway: Win tickets to see Peter Pan at Walton Arts Center!